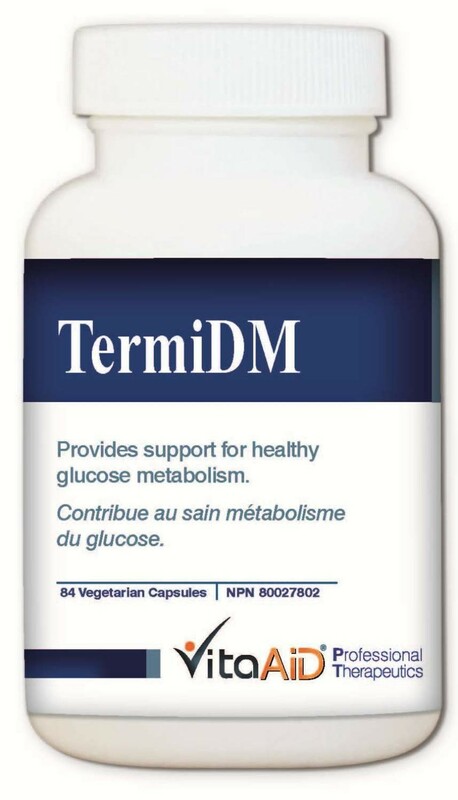 TermiDM is a comprehensive herbal formula with alpha lipoic acid and glucose tolerance factors (GTF) specifically designed for blood glucose control and protection against hyperglycemic complications. Helps to control blood glucose levels via different mechanisms that enable reaching the therapeutic goal more effectively. Contains Mulberry leaf extract that inhibits glucosidase, which digests disaccarides to glucose. Contains aqueous cinnamon extract that is clinically proven to reduce the glucose level by increasing both the insulin sensitivity and the insulin secretion. Contains milk thistle and alpha lipoic acid to help balance glucogenesis and glycolysis in the liver, as well as reduce the risk of neurogensis pathology of diabetic complication. Contains organic chromium from natural S. cerevisiae chelation that has been proven safer and more bioavailable compared to other forms used in glucose control. Suggested Use: Adults - Take 1-2 capsules, three times a day just before or with meals, or as directed by a health care practitioner. Caution: Monitor blood glucose levels regularly when taking this product. Do not take if pregnant or breastfeeding. Discontinue use if hypersensitivity/allergy occurs. For adult use only.